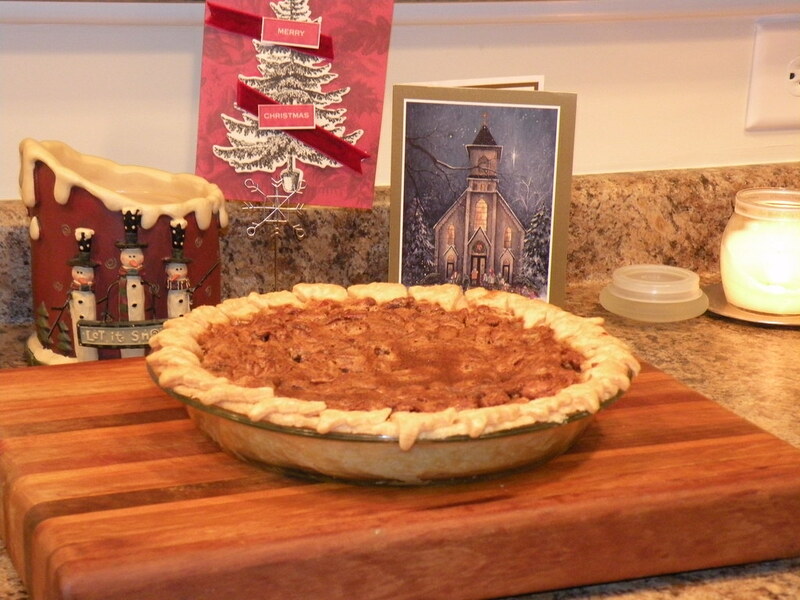 this pie is one of tom’s favorite desserts, if not his absolute favorite dessert. it’s frequently served at thanksgiving and Christmas. but i make it several times during the year, dressing it up with mini pie crust cutters. sift together the flour and salt. cut in half the shortening with a pastry blender until the mixture looks like cornmeal. then cut in the remaining half until the pieces are sizes of peas. divide dough by about 2/3 and 1/3. form ball. flatten slightly and roll on lightly floured pastry cloth. (i use saran wrap.) roll 2/3 dough in a circle form, if edges split, pinch together. always roll from the center out to the edge. use light strokes. place in pan, cut off excess dough around edge of pie dish. roll remaining 1/3 dough out. cut shapes from dough, brush with small amount of water, place on edge of crust. place pie in the fridge while preparing filling. cream sugar and butter. add syrup, salt; beat well. beat in eggs, one at a time. add pecans. pour into a 9-inch pastry-lined pie pan (see above :)). bake in a moderate oven (350°) 1 hour and 10 minutes – or till knife comes out clean.